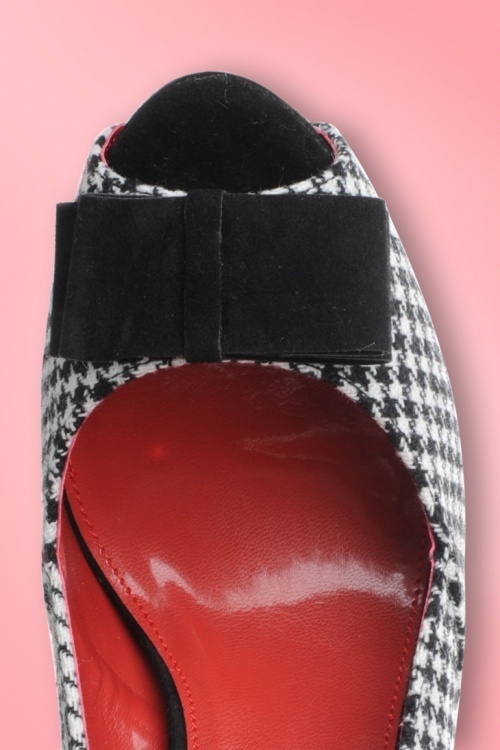 Retro 50s Bella platform pump Houndstooth Bow from Pin up Couture - With great pleasure we present Pinup Couture shoes! Partnering up with the same company that brought you the fabulous Bordello line, we've present you a line of beautiful and affordable vintage-inspired shoes that will live in perfect harmony with the rest of your Pinup Girl wardrobe. These Bella peeptoe platform pumps are the ideal combination: "Vamp meets Secretary". They are not for beginners and with these pinup style shoes you will stand out in the crowd - literally! They have a concealed 2cm / 0.8 " platform, so they are not as high as they seem to, but that is a little secret between you and me! Made of Houndstooth black white fabric with black suedine contrasting heel. Peep toe and a bow detail at the vamp. Joëlle wears the Lapel Dress from Glamour Bunny. As seen in Cosmo Girl!